Our fund updates will provide intuitive insights into the investment market which will enable financial advisers to be better equipped to deal with the growing complexities of investing money for your clients. > What are the expected returns from Gloval vs Australian equities? The market can ignore great earnings growth.. But not for long! > Is there any growth left for the banks? Reporting season serves as a vital time for market participants to justify or challenge recent sentiment, and to recalibrate pricing to fundamentals. It is during these periods that the Hyperion portfolios tend to outperform as our portfolio companies prove they can deliver superior sales and earnings growth regardless of cyclical factors or market conditions. Learn more about what this reporting season tells us about the state of the market and the stocks in the Hyperion portfolios, as Managing Director Tim Samway discusses the recent results in this live webinar. In excess of 90% of our alpha has been historically generated around reporting season. So reporting season is clearly an important time for Hyperion’s portfolios and one when our process is put to the test. In excess of 90% of our alpha is generated around reporting season historically – clearly an important time for Hyperion’s portfolios and one when our process is put to the test. 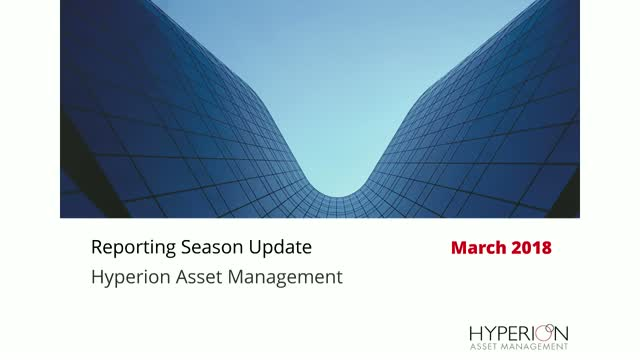 Learn more about what this reporting season tells us about the state of the market and what this means for the Hyperion portfolios looking forward, as Portfolio Manger Justin Woerner discusses the recent results in this live webinar. - Hyperion's focus on predictability is put to the test - how did we fare? - Where we expect growth to come from now. And where we think it won't it come from.